For children from 6 to 10 years of age. Experiment, play and learn with art. 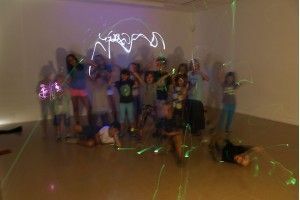 In connection with ACVIC's ART + SCHOOL+ CHAOS exhibition, this workshop will explore the creative possibilities in the concept of chaos, through a number of different projects. Children from 6 to 10 years of age, eager to play, experiment, and let their imagination soar. Reservations will end on Wednesday 21st June, and can be made by using the application form on the ACVic website, or by calling 93 885 37 04. Please note that there is a limited number of places, and that these will be allocated on a strict first come, first served basis. Taking a look at what chaos is, based on projects from the ART + SCHOOL + CHAOS exhibition. Experimental activities using light, shadow, colour, texture, among other things. Playing with volume, material, construction, and much more. We would suggest that children bring along something to eat for breakfast, and clothes for making a mess in. Some activities will take place outside, around and near ACVic. Bruna Dinarès and Elisabet Wenceslao, members of ACVic's educational team, with Assumpta Cirera-Tuti as educational assessor.